Photo: A round clear acrylic circle Christmas ornament, with white stars, snowflakes, and the words, "Light the World"
Welcome to the first installment of guest posts during this #LightTheWorld season. Each week of this month the focus will be just a little bit different. We'll start with "Light the World," then "Light Your Community," "Light Your Family," and finally, "Light Your Faith." I've invited several different individuals to share their ideas with us, and I'm excited to hear from them throughout this month. Nancy of Wyoming Breezes is a great example of serving others, and I was so delighted when she agreed to share with us a little bit about one of her favorite volunteer organizations, Quilt of Valor. Photo: The Quilt of Valor Foundation logo: 3 red squares on top, and 3 blue squares on bottom, each with a Q, O, or V. Between the top and bottom squares is a white area, with the word "Foundation"
I am thankful Kristi asked me to write a post about the Quilt of Valor Foundation that has awarded 204,509 quilts to military service members and veterans touched by war, and that number changes daily. Quilt of Valor has been a passion of mine for eight years, and I’m proud to have made 149 Quilts of Valor (QOV) during that time. Photo: Just one of the many quilts Nancy has made. The center panel of the quilt features words and phrases such as "United We Stand," "Hero," and "Land of the Free Because of the Brave." The center panel is triple-bordered, first in blue, then creamy-white, then red. Strips of fabric radiate out from the red border to complete the quilt. The national Quilt of Valor group has guidelines for the quilt sizes and the materials used. Most, if not all, of the materials are donated by those who make the quilt tops and those who machine quilt them. The size requirements can be found here. Almost any pattern can be used for a QOV. Listed below are some of my favorite sites for quilt and/or quilt block patterns. 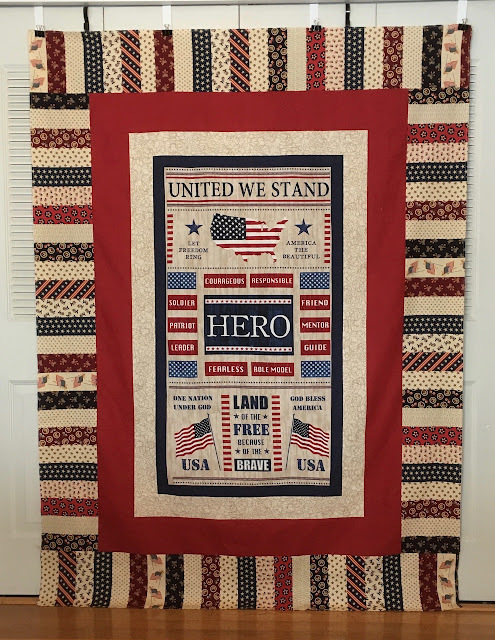 The patterns/quilts that appeal most to the recipients are those that reflect a patriotic theme. The most desperate need is for longarm quilters. All of the QOV are machine-quilted, so the demand for volunteer longarmers is critical for the program to succeed. If you or someone you know is a longarm quilter and could volunteer to quilt at least one quilt a month, your service would be greatly appreciated; simply fill out the form on this page, and the Longarm Coordinator will contact you. When a QOV top has been pieced and a backing prepared, the topper fills out a form to be paired with a longarmer. After receiving a mailing address, the topper will send the top and backing to the longarmer. The longarmer supplies the batting, thread and the time to quilt the QOV. The quilt is then mailed back to the topper, who adds a label, binds the quilt and sends the QOV to a State Coordinator. The State Coordinator works with local groups in arranging award presentations. Photo: An awards presentation organized by the Nebraska chapter of the QOV. They organized an all-female veteran Honor Flight to Washington, D.C. and awarded 135 women veterans a QOV. This photo shows the veterans with the quilts they chose. Individual volunteer opportunities for making a quilt top and for machine quilting were explained above; however, the possibilities do not stop there. Communities, churches, or individuals can host a “Sew Day” to simple make blocks. Volunteers could be used to cut fabric, press the blocks for those who are sewing, setting up table, arranging for a sewing site, etc. The National QOV group has a block drive every year. The information and pattern for the 2019 drive is located here. Ask at a local fabric/quilt shop if an Under Our Wings program is scheduled in your area. If not, perhaps, you and some friends could plan to host the event. It’s a great opportunity to involve youth in this service opportunity. QOV also hosts a national Sew Day (posters and information available) every year. Individuals can do this in their own home, or groups can plan to work together on blocks or quilts on that day. The most rewarding part of the Quilt of Valor program is seeing the veterans’ faces when they are awarded their QOV (each veteran is qualified to receive one QOV) in their lifetime.) 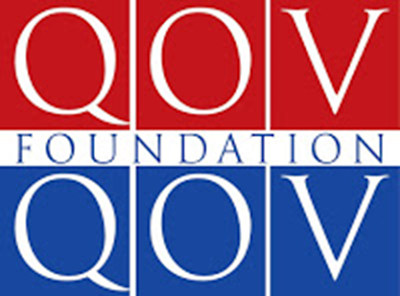 Anyone can nominate a veteran to receive a QOV by filling out this form. More information can be found on this page. Some communities arrange for large presentations on/near Veteran’s Day. In my former community nearly 100 veterans are honored each year. Boy Scouts and veteran organizations love to assist with these large presentations. Other times, families want private presentations, and those can be arranged as well. More information can be found on the Quilt of Valor website. I'm thankful for Nancy and for her example of service to those who serve their countlavorite charitable organization? Comment below and enter this week's giveaway. 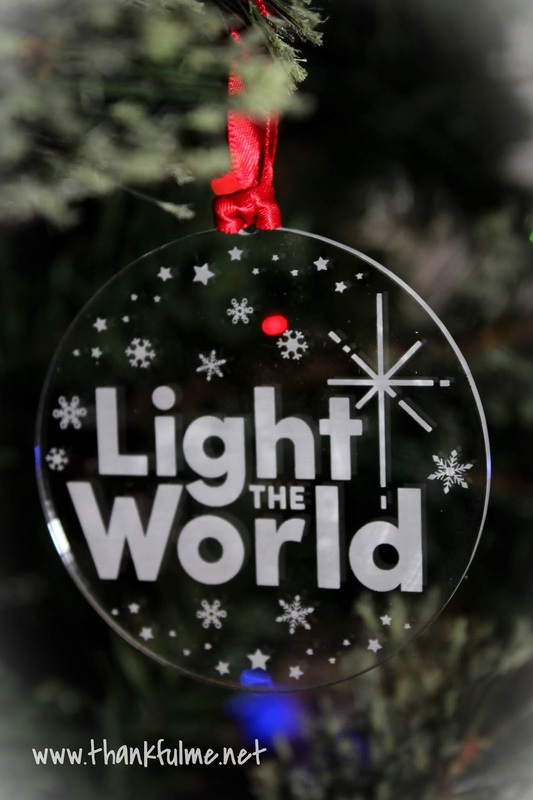 The prize is a #LightTheWorld ornament, compliments of LDSBookstore. My daughter is an Army medic, i am thrilled when i read about any organization that reaches out to our military. Thank you so much, Nancy and Quilts of Valor! I don't remember how I first found Nancy's blog, but I have been following her for years, and am so impressed by all the charity quilting (and knitting) she does. I'm glad she agreed to share with us about the Quilt of Valor Foundation.